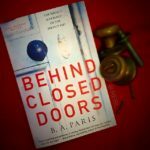 If every book read like Behind Closed Doors by B.A. Paris, nobody would know the TBR struggle. This is a debut book and I'm already jones-ing for the next.